Weekly English Grammar: NOUN को जानें ! 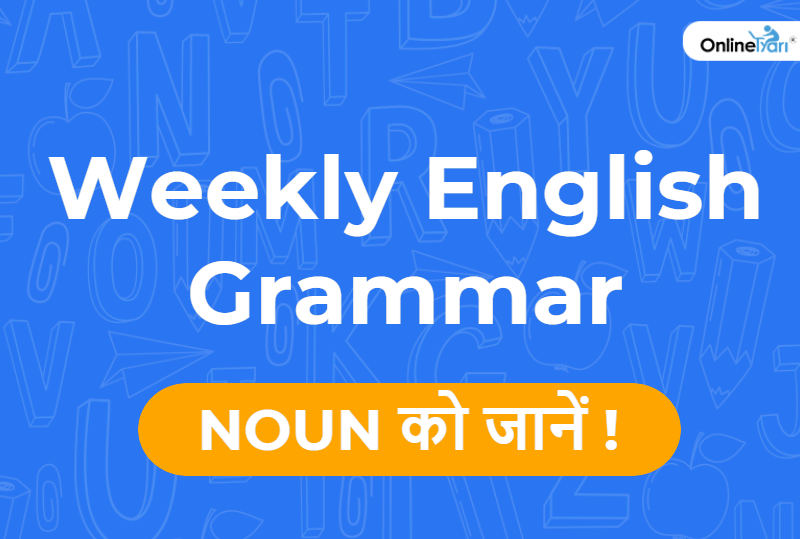 Weekly English Grammar: NOUN को जानें ! / Government Exam / Weekly English Grammar: NOUN को जानें ! Noun की definition की बात करें तो आपको याद ही होगा की बचपन में आपके teachers ने आपको बताया था कि noun is a name, person, place or thing. But what about ‘ideas’, ‘feelings’, ‘emotions’? क्या ये Noun नहीं हैं? I know it is very confusing but don’t worry इस लेख में हम बताएँगे कि आखिर Noun को define कैसे करे? इसी के साथ जानेंगे Noun सम्बंधित कुछ ग्रामर के Rules. Simple definition से लेकर complicated explanation तक “Noun” की बहुत सारी definitions हैं, लेकिन समझने का सबसे अच्छा तरीका है कि एक Noun करता क्या है? आखिर इसके काम क्या – क्या है? इनसे पहले articles ‘a’, ‘an’ और ‘The’ का use किया जाता है| e.g. a Dog, an umbrella etc. E.g: Japan, Mumbai, Vibhav, The Ganga, etc. d. Material Noun: Material Noun उस matter या substance को denote करती है जिससे वस्तु बनी हो | e.g: Iron, Silver, Milk, Silk etc. e. Abstract Noun: Abstract Noun is all about feelings, senses and qualities यानि की abstract noun भावनाओं को denote करती है। ऐसी चीजें जिन्हे आप देख या छू नहीं सकते जो बस महसूस कर सकते हैं, उन्हें abstract noun की तरह treat किया जाता है। e.g. Goodness, Hatred. Childhood etc. इसी तरह से एक Honest एक adjective है और इससे बनाने वाला noun Honesty. Friend एक adjective है और इससे बनाने वाला noun Friendship. Some words as stomach does not follow this rule. Rule no. 6: कुछ nouns की singular और plural form same ही होती है। e.g: Pair, Score, Stone etc. Rule no. 8: कुछ noun हमेशा plural noun की form में ही use होते हैं। e.g: Trousers, Assets, Vegetables etc. Rule no. 9: कुछ noun ऐसे होते हैं जो देखने में तो plural लगते हैं but होते singular है, कहने का मतलब है की इनके साथ हमेशा plural verb ही use होती है। e.g: Physics, Innings,News etc. अब यहाँ भी एक exception हैं कि अगर इन plural looking singular nouns को personalized या possessed form में देखा जाए तो ये plural noun की तरह use किये जाते हैं। e.g: The politics of our country are not good. Rule no. 11: ऐसे nouns जो -um पर end होते हैं उन्हें केवल ‘s’ लगाकर plural बनाया जाता है। e.g: Pendulum/pendulums, Forum/Forums etc. e.g: Call after Call, Word for Word etc. Rule no. 16: Digits, Abbreviation में ‘s’ लगाकर इनके plural form बनाये जाते हैं। 90/90s, B.Sc/B.Scs etc. Rule no. 17: Abstract noun की plural form नहीं होती। e.g: Kindness, Happiness etc. Rule no. 18: कुछ material nouns की भी plural form नहीं होती। e.g: Copper, Iron etc. Rule no. 19: Nominative Case: जब noun को subject की तरह किया जाता है तो इसे Nominative Case कहा जाता है इसिलए Subjective Case भी कहा जाता है। e.g: Anup is not behaving well. e.g: Mahima’s Doll , Raghav’s book etc. अब सवाल ये उठता है कि कहाँ apostrophe ‘s’ और कहाँ ‘of’ का किया जाता है ? Rule no. 23: Dative Case: एक ऐसा noun जो verb के लिए indirect object होता है तो वह dative case में कहलाता है। e.g: The Postman brought me a letter. e.g: That Pen belongs to Neelam. So guys these are the rules and cases you need to learn to ace NOUN. तो बिना किसी stress के बस keep practising.